Jean at the 40th reunion. I GRADUATED FROM BALL STATE IN 1967 WITH A MAJOR IN SPEECH AND HEARING THERAPY AND A MINOR IN BUSINESS. I MET MY HUSBAND AT BALL STATE. WE GOT MARRIED IN DECEMBER 1968 JUST BEFORE HE COMPLETED PILOT TRAINING IN THE AIR FORCE. WE HAVE MOVED A DOZEN TIMES IN THE 34 YEARS WE HAVE BEEN MARRIED BUT ENDED UP IN PHOENIX WHERE WE HAVE LIVED FOR THE PAST 15 YEARS. 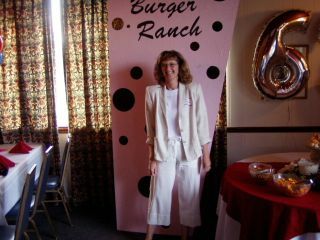 I WORKED AS A SECRETARY FOR A NUMBER OF YEARS BUT HAVE BEEN A STAY AT HOME MOM EVER SINCE WE MOVED TO PHOENIX. GENE IS A PILOT AT SOUTHWESST AIRLINES AND HAS LOVED WORKING FOR THEM. OUR SON, MAC, IS 16 YEARS OLD AND A JUNIOR IN HIGH SCHOOL. HE’S A GREAT KID-DRIVES A JEEP, WORKS AT THE MOVIE THEATRE, AND IS ON THE WRESTLING TEAM. SINCE WE WERE 41 WHEN HE WAS BORN, I THINK HE HAS KEPT US YOUNG! 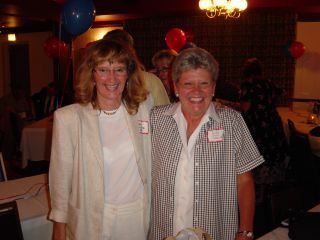 Jean with Judy Ginn at the 40th reunion.